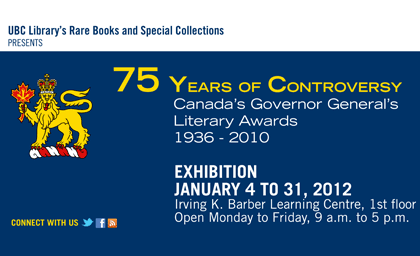 UBC Library’s exhibition, 75 Years of Controversy: Canada’s Governor General’s Literary Awards 1936-2010, has been making headlines. Articles have appeared in ArtsWIRE, the publication from UBC’s Faculty of Arts, and the Ubyssey, UBC’s student newspaper. From January 4-January 31, 2012, UBC Library’s Rare Books and Special Collections division is hosting a display highlighting some of the more contentious episodes that have taken place during the awards’ first 75 years. Find out more at our blog post.